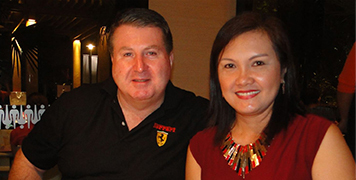 Prime Choice Fine Quality Meats is the creation of husband and wife team, Scott Chambers and Merlyn Rondrique Chambers. The company was established on December 18th, 2013 and has grown steadily since then to now cover a large part of Luzon with plans to expand beyond that. The great connections they have developed with some of the best meat exporters from the USA and Australia has helped fuel this growth and build a solid reputation for quality of produce and service at competitive prices. As Scott explains “The company currently operates from our Head Office in Amadeo, Cavite covering the NCR and beyond. We started our first Butcher Shop in Boracay over 2 years ago on the holiday Island of Boracay and our sales & delivery presence currently extends to Central Luzon all of which works together to ensure the best service, product availability and coverage for all our loyal customers. We have now recently relocated our Butcher Shop to Cavite however we have still kept a presence in Boracay to enable us to service our many loyal customers there. We are also able to provide the BEST Australian Double Smoked Streaky, Back, Full Rasher Bacon and Ham in the Philippines. We also make our own amazing Pork, Lamb and Beef Sausages as well as Lamb and Beef Burgers”.